STUTSMAN, ENOS, lawyer, legislator, treasury and land agent; b. 14 Feb. 1826 in what is now Fayette County, Indiana, son of Nicholas Stutsman; d. 24 Jan. 1874 at Pembina, North Dakota. Enos Stutsman was of German ancestry, his grandfather Jacob having settled in Pennsylvania in 1728. After being educated in what is now Coles County, Illinois, Enos taught school from the age of 17 to 21, then studied law, and was admitted to the bar in 1851. In the 1850s he combined a law practice with a real estate business in Des Moines and Sioux City, and was active in politics as a Democrat. He moved to Yankton, Dakota Territory, in 1858 to supervise the laying out of a townsite for the Yankton Land and Town Company. From 1862 until 1873 he was a member of the territorial legislature of Dakota representing the Yankton and later the Pembina district. Stutsman was appointed a United States treasury agent in 1866 and thereafter divided his time between Yankton and Pembina, the latter being the site of the only customs house in Dakota Territory. Four years later he became a government land agent. During the Red River disturbances of 1869 and 1870 he was one of a group of Americans at Pembina and Fort Garry (Winnipeg) who were actively promoting the annexation of the Red River Settlement to the United States. It has been suggested by Professor W. L. Morton that his intrigues were directed towards obtaining American intervention in the disturbances and the establishment of a military post at Pembina from which he would benefit as a result of his land speculations in the area. Alexander Begg*, the diarist, records his many visits to the Red River Settlement and to Louis Riel* at this time. 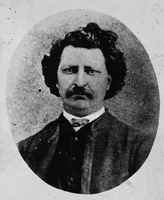 Along with other Americans he had easy access to Riel during the early days of the disturbances and sought to influence the Métis leader in favour of union with the United States; it seems generally agreed today that, whatever his fears for the rights of his people with the entry of Red River into Canada, Riel never seriously considered annexation. 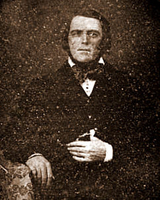 Stutsman was, along with Joseph Rolette, one of a group of “correspondents” at Pembina forwarding distorted accounts of the events at Red River in 1869 and 1870 to the St Paul Daily Press, on which Canadian papers relied for their reports about the disturbances. Stutsman was a curious if not pathetic figure on the Dakota frontier having been born with practically no legs. He used crutches throughout his life but was able apparently to move about the country independently by wagon or on horseback. He died a bachelor and was buried in Sioux City, Iowa. Begg’s Red River journal (Morton). Stanley, Louis Riel. G. W. Kingsbury, “Enos Stutsman,” North Dakota State Hist. Soc. Coll., I (1906), 350–54. Hartwell Bowsfield, “STUTSMAN, ENOS,” in Dictionary of Canadian Biography, vol. 10, University of Toronto/Université Laval, 2003–, accessed April 24, 2019, http://www.biographi.ca/en/bio/stutsman_enos_10E.html.